Have you been wondering, “Where can I find storage containers for rent near me in Phoenix, AZ?” Fortunately, at Haulaway Storage Containers, we have the perfect solution for you! Stop worrying about how difficult it will be to have a secure shipping container delivered to your house – we can often deliver to your door by the next business day. After more than 45 years in business, we’ve learned a thing or two about quality customer service. Our commitment to your needs is what makes us the best shipping container rental company in the Western United States! With custom lengths between 10 and 40 feet, there’s a container for every purpose imaginable. Many of our units feature our patented Rhino Locking System for the added security, in addition to 14-gauge steel construction. Perhaps you’re looking to work out of your shipping container during the summer when temperatures are rising? Not a problem. Several of our units feature doors on both ends, allowing for great airflow and internal temperature regulation. So instead of endlessly asking friends or family, “Where are the best shipping containers near me?” consider renting a shipping container from Haulaway Storage Containers. 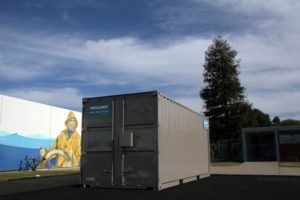 Not only will our containers save you time and money, but they will save you the headache of self-storage units. Gone are the days of driving back and forth between your home and your storage unit. With one of our convenient storage container rentals, you can easily access all your valuable belongings in mere minutes! Getting started is easy. Simply give us a call at our toll free number, or fill out the online form to get your free quote. Haulaway Storage Containers has the best storage containers for rent near me in Phoenix, AZ!